The interior of a Black River Falls Barbershop with customers in chairs and barbers at work. Numerous mirrors, pictures, and lamps hang from the walls and ceiling. 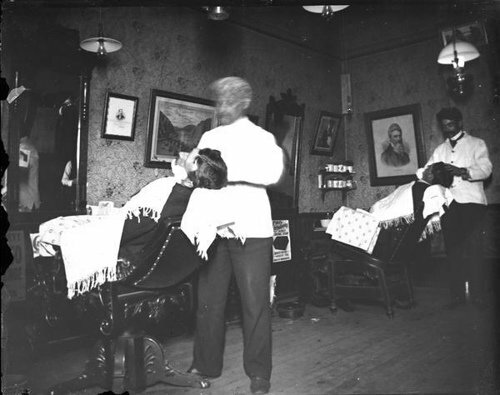 Man in first chair is leaning way back with his face lathered, the part in his wavy hair visible, the barber caught in motion; man in second chair has clean face. This page was last modified on 9 October 2008, at 15:38.